True artists don’t need anything fancy to make awe inspiring works. 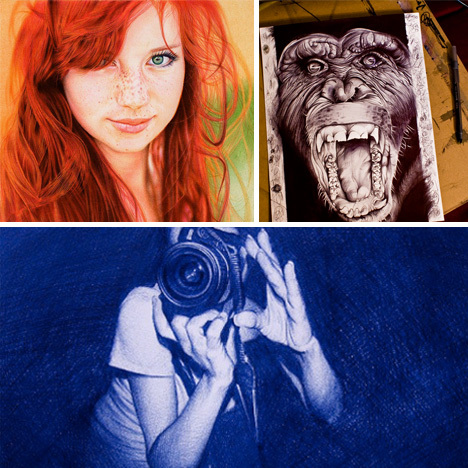 These ballpoint pen artists can come out with something that’s photo realistic and vibrant in color (or equally vibrant in contrast). 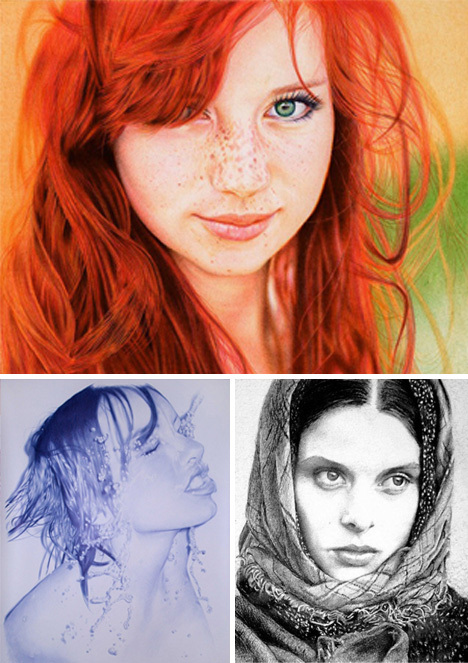 These works look like heavily-filtered photographs, but they’re actually drawn by hand using simple ballpoint pens. Spanish artist Juan Francisco Casas (pictured above with one of his works) has mastered the art of creating epic and realistic murals with one of the simplest materials. You can find more of his work here (some nsfw). 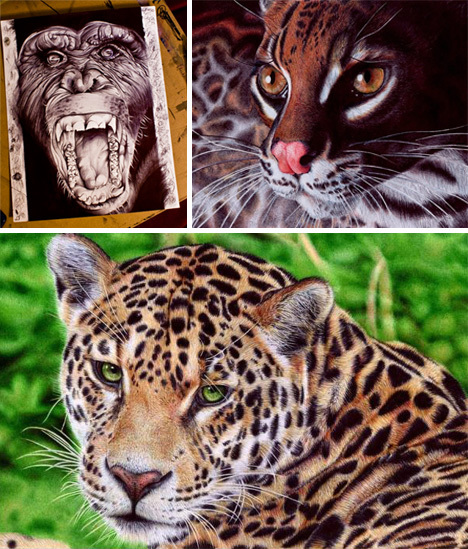 Amanda Ortiz has some truly epic artwork on her site, including this great ape showing his angry face. 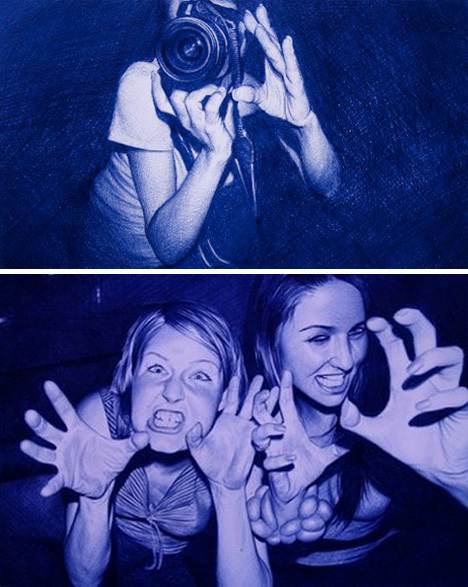 Portugal based attorney Samuel Silva creates gorgeous and colorful ballpoint pen artwork as a hobby. These two animals are based on photographs, and look almost too real to be true (but I promise, they are). 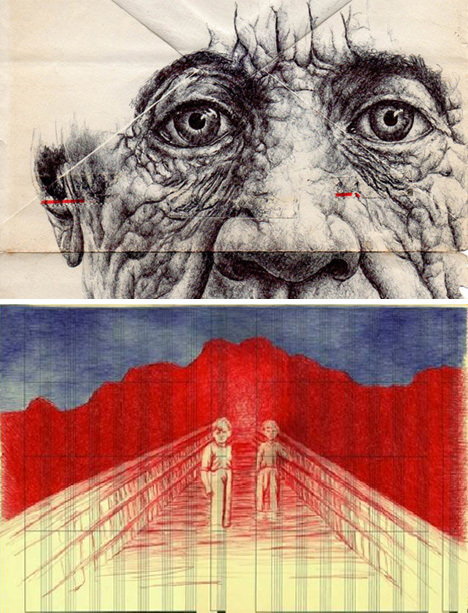 Artist Mark Powell uses nothing but a ballpoint pen and an envelope to do his art, and the choice of medium works incredibly well at giving it a transitive feel. Vanessa Prager’s “Love You Too” series is full of colorful pen pieces that illustrate a slightly abstract emotional landscape. Juan Francisco Casas was mentioned earlier in this post, but his work deserves further exploration. The camera man likely much prefers this portrait over the one he took with his camera, and Juan has done an amazing job at capturing every shade and wrinkle of these two girls. Arguably Samuel Silva’s most stunning work, this piece is based on the photograph of a fiery redhead and does her real justice. Dave Archambault created this piece of a young girl wearing a shawl and does a fantastic job at recreating the threads and folds of her headwear. Finishing up is an action shot by Juan Francisco Casas.